A scholarly rebuttal to those who are pessimistic about the progress of human rights. 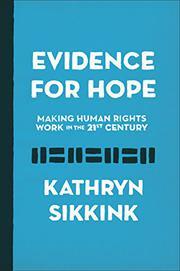 In her latest book, Sikkink (Human Rights Policy/Harvard Kennedy School of Government; The Justice Cascade: How Human Rights Prosecutions Are Changing World Politics, 2011, etc.) responds to attacks on the legitimacy and effectiveness of human rights law, institutions, and movements. She argues that different conclusions arise concerning human rights progress when comparisons are made to an ideal and when they are made through systematic empirical research, her preferred method. This is a dense, data-driven, and academic text, and the author encourages readers to skip around and select the chapters that interest them most. Those more interested in the practical aspects of making human rights work in the 21st century may wish to forgo the arguments about measurement and focus on the policy recommendations for the future. Sikkink acknowledges that some human rights issues have been worsening—especially related to the refugee crisis, immigration, and economic inequality—but she documents and charts areas of improvement: ratification of human rights treaties, women’s rights, education, and the decline in infant mortality, genocide, use of the death penalty, and battle deaths. For policy-oriented readers, the author proposes six approaches that have been proven effective: seek nonviolent solutions to conflict, promote democracy, guard against dehumanizing practices, ratify and enforce human rights treaties, support accountability that can deter future crimes, and expand mobilization on behalf of human rights. In her conclusion, Sikkink asserts that because human rights tactics are mainly deliberative and nonviolent, change comes slowly and only as a result of concerted struggles. Through her research, she effectively demonstrates what has been done in the past, giving doubters and pessimists reason to hope about what can be done in the future. From a scholarly activist, a solid and encouraging piece of research on the status of human rights around the world.